This tiny mountain 'home in the sky' is set inside a ski gondola! Nest is famous for reimagining unloved objects, and they've done it again with the reinvention of a ski gondola, or funitel, into Nest Express - an adorable tiny "house in the sky." Lucky skiers and snowboarders at California's Squaw Valley mountain resort now have the opportunity to cozy up inside a cedar wood-clad living room as they ascend the slopes. The transformed lift was developed as part of Nest's Thoughtful Things campaign, which includes similar experimental makeovers of neglected everyday products. Painted in Nest’s signature light blue, the Nest Express operates more like a cozy and mobile living room, than an actual home. The design team swapped out the icy metal benches with wrapped, Pendleton-designed benches, and covered up the typically barebones walls with cedar wood planking. Framed artwork and curtains add an extra homelike touch. The snug and warm space also features a glowing Nest Learning Thermostat and a Nest Protect: Smoke + Carbon Monoxide alarm. The smart technology is programmed with a female’s voice that greets passengers. Nest Express will stay a part of Squaw Valley all winter long. You can see more pictures or post your own with the tag #nestexpress. The Nest Express operates more like a cozy and mobile living room, than an actual home. The design team swapped out the icy metal benches with wrapped, Pendleton-designed benches, and covered up the typically barebones walls with cedar wood planking. Nest Express is painted in Nest's signature light blue. The snug and warm space also features a glowing Nest Learning Thermostat and a Nest Protect: Smoke + Carbon Monoxide alarm. The smart technology is programmed with a female's voice that greets passengers. 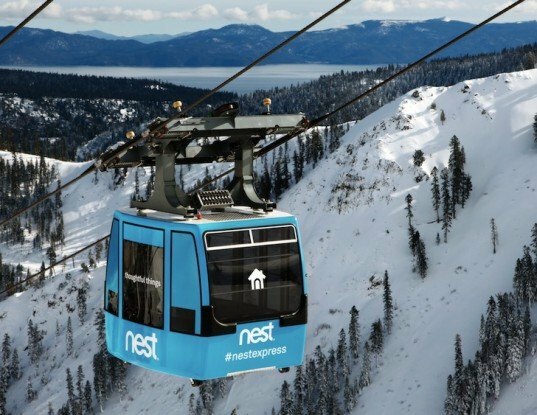 Nest Express will stay a part of Squaw Valley all winter long.